We’ve always known from the first moments after he arrived in our lives that there was something different about Danny. We, that being myself, Dad Andy, Mum Sarah and big sister Sophie, were very excited about a new addition to our little family. There was no concern shown during the pregnancy. It was mentioned that there was a lot of fluid around the baby, and Sarah felt she was the size of a house, but apart from some extra scans all was pretty routine. On the day, however, things were more involved. A long, relatively uneventful labour (well, for me anyway!) was brought to an abrupt halt by a room full of doctors and a ventouse. Then it was just us – Sarah, me and Danny – and an otherwise empty room. Danny was covered in vivid purple marks. Nobody would meet our eyes when we looked outside the room. We instinctively felt we needed to tell our little fella that we would take extra care of him, that we would protect him, that we would help him through everything. Now the search began. Something is different about Danny. But what could it be? The trail starts with Sturge-Weber, takes a scary detour to craniosynostosis, and involves CT and ultrasound scans plus lots of blood tests and a bewildering array of specialists. Everybody is a bit perplexed. Danny has a lot going on. His head is large and not consistently shaped, he still has lot of birthmarks, although they’ve faded a bit, his fingers and toes are different sizes and his skin is quite spongy. It’s also noticed that he’s not meeting his milestones. He can’t sit up for long, won’t crawl and doesn’t make much if any speech noise. One thing he has got though is a fabulous smile. It’s thought that Danny may have two syndromes, as the physical symptoms don’t explain the developmental delay, and vice versa. We’ve also noticed a few things. Danny loves doors, any size, shape or colour, and once focused on them takes a lot of shifting. He loves his food, to the point where he fills his mouth to bursting. He’s also a complete charmer, especially with the ladies. The door thing leads to an assessment for autism, which is inconclusive. So by April 2013 we find ourselves without a diagnosis. We’d resigned ourselves to never knowing what Danny had got. Then we’re offered an appointment with a locum geneticist. Who shows us a leaflet. Which changes our lives. The syndrome is MCAP, and it explains everything. Now we can learn about it, research it and begin to understand Danny a little better. The last 15 months have been tremendous. I think the fear disappeared with the diagnosis. We changed from being concerned about what sort of life lay ahead for Danny to having plans to develop his future. We know there will be challenges for all of us, some tough times, also some frustrations. But we have a very special little boy on our hands. As he has made progress, with the help of a fabulous special school, he shows us more of his personality. He’s very cheeky, smiley, friendly and chatty, has the naughtiest laugh ever, he’s mischievous and a handful, he’s your ordinary 4 year old little boy. He learns stuff all the time, works things out and when he gets something and shows us, and we show him that we’ve noticed, his face just lights up! The other bonus of getting a diagnosis was being able to find out about other families who were having a similar experience. It had been a lonely road up to then, but joining the network has been really encouraging. We get lots of great free advice, tips and support. We went along to the recent UK get-together and it was a terrific boost to see how positive the vibe was and how well all the kids were doing. It struck us on the way down that we had never met another child with Danny’s condition. We were really touched by the openness and encouragement given to us ‘newbies’ and we knew for certain that we were no longer dealing with anything on our own. We hope we can be as encouraging and supportive to future families who will be touched by this condition and maybe our story will give them some strength. We’re so lucky with Danny, he takes everything in his stride and faces every day with his fantastic smile. 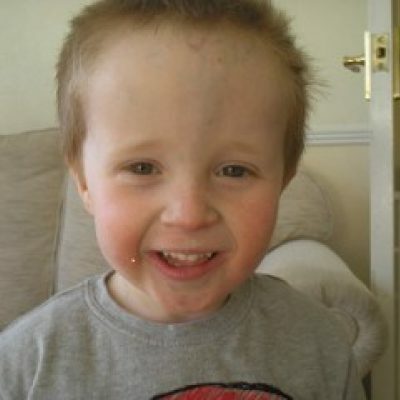 Yes, there is something different about Danny, he’s a truly inspirational little boy.